Thank You! | Oh Sarah O ! Guess who got their Friendship Bracelet Swap bracelets in the mail? I did! If you don't recall, on October 12th I told you all that I was participating in Friendship Bracelet Swap 2.0 hosted by Chasing Davies and that my swap partner was the lovely Surinder aka. Miss Sassypants. The cuff was made by Miss Sassypants but the bracelet's came from Mexico and were purchased from a young man on the beach. 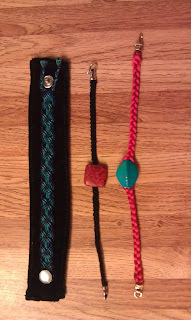 The other two bracelets were made by Miss Sassypants with beads given to Miss Sassypants by a friend. I couldn't be more thrilled with my bracelets and they are even nicer and more beautiful than I imagined. In other news, I was also the winner of the GS Lillian Cuff giveaway by Chasing Davies (as seen above in an image from Chasing Davies) and I promptly slapped that baby on my wrist and wore it out to the Evil Dead Musical this weekend. So I want to sent a big thank you out to Surinder of Miss Sassypants for the beautiful friendship bracelets, and a thank you out to Meg of Chasing Davies and GS Lillian for putting on the cuff contest and awarding me with the cuff. 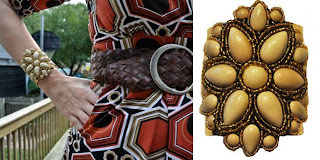 Look out for these bracelets and cuffs in future fashion posts.